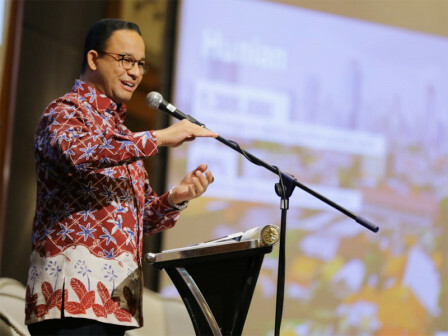 Jakarta Governor, Anies Baswedan revealed that development in the capital must reflect equality. Hence, the design of a city needs to be directly proportional to the behavior of its people.
" This design can shape behavior and can make this city feel equal to all"
"This design can shape behavior and can make this city feel equal to all," he expressed, on the sidelines of Transforming Lives Human and Cities 2018 Seminar, in one of hotels in Tugu Tani area, Central Jakarta, Tuesday (9/4). It is hoped that academics in the seminar can discuss good city design. By so it is able to create a house as the first space, school or office as a second space, as well as public facility as a third space that truly gives comfort. "The third space is between the first and second spaces. This public space must be able to realize close interaction with each other," he explained. The seminar could also create inputs to realize the design of the third space needed by Jakarta residents. "We have started on Jalan Sudirman sidewalk that can be used by pedestrians and becomes a place of artistic and cultural expression," he stated.